November 2017 issue on sale now! | What Hi-Fi? 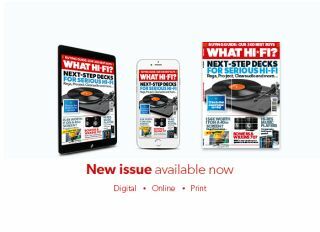 Just a few weeks ago, we were enjoying the last of the summer sun – now we’re counting down the days until Christmas and opening up the November issue of What Hi-Fi? - it hits the newsstands today. Up front, it's a tale of turntables. Technology has changed the way we listen to our music, but the remarkable longevity of vinyl shows that nothing quite compares to the thrill of placing the record on a deck. November’s What Hi-Fi? issue focuses on the technology that simply refuses to go away, with a round-up of the best mid-range turntables available on the market. Four decks from Edwards, Clearaudio, Pro-Ject and Rega go up against each other, and the winner is… revealed in the issue. So you’ve seen some of the best turntables around, but what to play on it? Despite being converts to hi-res audio, we think there are some tracks that will never sound as good as they do on 12 inches of plastic. Whether it’s nostalgia, rarity or simply listening to the track as it was originally intended, we’ve selected a few of the vinyl tracks that never fail us. And as a bonus, we’ve thrown in a list of our favourite fictional record stores too. From Championship Vinyl in High Fidelity to The Chelsea Drugstore in A Clockwork Orange, these are the fictional places the real-world us would like to shop at. The November issue also brings together the finest portable music players around, featuring models from Shanling, Onkyo, Fiio and Astell & Kern. Thanks to the increased popularity of hi-res streaming, this often overlooked category could be due a revival. Your smartphone is capable of streaming, sure, but if you really want to make the best of hi-res audio a dedicated player is the way to go. New to hi-res audio? Don’t worry, we have that covered too! What it is, how it works and how to get it – all explained in our handy guide. Televisions have been getting bigger, and what was once considered a big screen has now become the standard. But with the resolution also expanding, is it worth watching 4K UHD TV on a smaller screen? We find out using a 40in Samsung TV, the MU6400. And there’s more! Flick through our First Tests section and you’ll find reviews of B&W 707 S2 speakers, Sony’s WH-1000XM2 headphones, Roksan's Blak integrated amplifier, the Sonoro Stereo 2 music player, as well as a surround-package from Monitor Audio, another Roberts Radio and the Epson EH-TW9300W projector. So now the evenings are darker, why not curl up on the sofa with a copy of What Hi-Fi? or load it up on your tablet or smartphone. Enjoy!